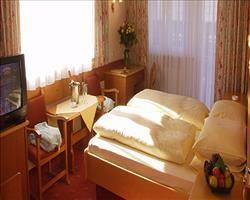 Set beside the main Reiterkogel gondola and ski hire shop, just a few metres from the centre. A contemporary mix of old and new, the Alpine Palace has a luxurious feel with modern alpine features, and enjoys excellent leisure and spa facilities. The Alpine Palace is under the same ownership as our ski school. Choose the original wing rooms for a great hotel at an affordable price. Rooms in both wings have telephone, radio, cable TV and hairdryer. We update Hotel Alpine Palace's details often, but facilities do change. e.g. some extras listed by the supplier as "free" or included might only be for the first time you use them, or for one time per party, then charged for further use. If any specific feature is essential to your holiday, make sure you ask us to confirm the details of it before you book your holiday. Hinterglemm lift pass price last reported as 245 € (adult 6 day). Ask for a quote when booking Hotel Alpine Palace. Hinterglemm has N S facing slopes. Gardenhotel Theresia Hinterglemm Austria, Dover Ferry 21st March. Zur Dorfschmiede Hinterglemm Austria, Dover Ferry 11th January. Hotel Glemmtalerhof Hinterglemm Austria, Dover Ferry 14th December. Hotel Sonnblick Hinterglemm Austria, Dover Ferry 21st March. "I'd give it Six out of Five if I could!" Going back here for the third time in a row and wouldn’t go back somewhere if I didn’t enjoy it – the Alpine Palace is one of the best hotels I’ve ever stayed in. The Alpine Palace has the best spa ever with an outdoor heated pool and there’s a games room too. Breakfasts are pretty damn good, they cook you fresh egg, bacon, omlet etc however you like it. Dinners are fantastic, 5 courses every evening including salad, soup and a main so I’ve never felt any need to eat out in the resort while I’ve been there. The staff have always been courteous and very good, you can always have a bit of banter with the staff behind the bar! I've never stayed in the real luxury part of the hotel, I always have a room in the cheapest bit of the building which I call “3 star accommodation” and has your average hotel rooms. You still have access to all the hotel’s 5 star facilities if you’re staying here though. 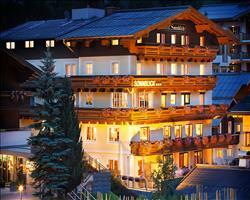 The hotel is in the centre of Hinterglemm, right by the small gondola lift that takes you up one side of the mountain. You can ski back down if there’s good snow but we usually go here quite late in the season when there isn’t enough to ski down. I’d give it 6 out of 5 if I could! "Been four times and will be back!" We love the hotel and have been here 4 times as a family, and we will definitely stay again. The food is very good – they do a 5 course dinner with a choice of 2 or 3 starters and main, and a salad bar and cheese and biscuits. My wife and daughter love the food – I prefer the pub up the road who do a fantastic steak and chips! We've tried both and think the more expensive rooms are not worth the extra cost, so I'd recommend the cheaper ones. 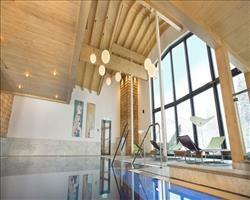 "Our favourite hotel for skiing"
The spa was amazing! The hotel is kept clean throughout and though the rooftop bar wasn’t open, the other bar was lovely. The food was very good. It was quite traditional, with a different choice of food on different nights. The a la carte nature of it may not be everyone’s cup of tea but we liked it. At breakfasts they handed out leaflets on the various different things you could do if you didn’t want to ski, like horse and cart rides or sledging. Bedrooms were small and very basic but perfectly well equipped for what we needed. The beds were comfortable. 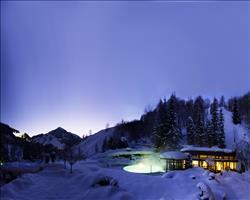 The hotel is very well situated for the slopes and to get to the ski rental – a 30 second walk for both. The boot lockers are really good – you get an individual locker per room and they’re heated.